Here’s an easy tasty Stuffed Pepper Soup perfect for stuffed pepper lovers. I tasted stuffed pepper soup for the first time several years ago at a restaurant in northern Wisconsin and was immediately smitten. So, when I saw this recipe for slow cooker stuffed pepper soup in a Gooseberry Patch Slow-Cooker Recipes Cookbook (Everyday Cookbook Collection) (affiliate link), I decided to give it a try. It’s unique in that it calls for a package of cooked Spanish rice, instead of plain or brown rice. The recipe also calls for two bell peppers. Green bell peppers can be kinda strong, even if you like them. So, I used one green and one red to tone it down a bit. And I added two cups of beef broth. This slow cooker stuffed pepper soup recipe turned out thick and hearty, perfect for a chilly fall or winter meal. You could substitute ground turkey if you wanted. Or turn it into a vegetarian slow cooker stuffed pepper soup by using veggie crumbles. 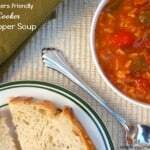 How Many Calories/WW Points in this Slow Cooker Stuffed Pepper Soup? According to my calculations each 1-cup serving of this hearty flavorful soup has just 179 calories, *5 Weight Watchers PointsPlus, *4 Weight Watchers Freestyle SmartPoints. Enjoy! If you’ve made this slow cooked Stuffed Pepper Soup, please give the recipe a star rating below and leave a comment letting me know how you liked it. 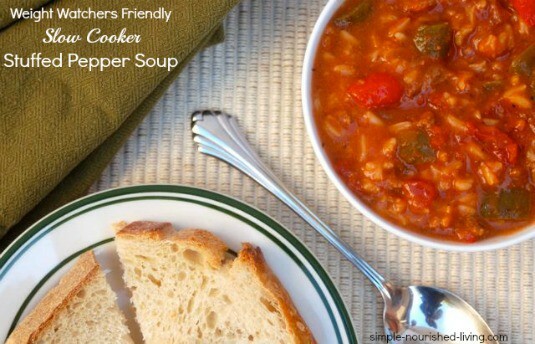 This slow cooker stuffed pepper soup is easy, healthy and delicious. It calls for a package of Spanish rice mix instead of plain cooked rice, which adds more flavor. I made this slow cooker stuffed pepper soup in my Ninja 3-in-1 Cooking System (affiliate link). The more I use it, the more I like it. This sounds yummy! I like the addition of the Spanish rice. Pinned! This was REALLY good! My whole family lived it. The 10 year old down to the 18 mo old. Thanks for a great recipe. Heard you on Half Size Me. Hi, I can’t wait to try your recipes! I do have 1 question, is the can of tomatoes drained? Thanks. No, the tomatoes are not drained. Use the tomatoes and juice from the can. This Spanish rice or white rice is added at the end for last 30 minutes right? ! I am trying both this recipe and stuffed pepper soup this weekend. The tomatoes for that recipe is drained too, right. Thanks! So excited to try these recipes I like that the the points are on each recipe ! at the end to let it warm and blend. Hope this helps. Yes, very much, Thanks for the quick reply! Happy New Year! Hi Annmarie, Glad you opted for the Spanish rice. It really adds a nice layer of flavor. I just tasted this and it is really good. It really does need the spanish rice , though. Definate keeper! I agree, Annemarie. The Spanish rice really makes it good! Thanks for sharing your thoughts. Hi Annemarie, Glad you liked them. I think that they should both freeze fine. Hi Jackie!! Hurray! I love to hear that 🙂 Glad it worked for you and your husband!! Very good. Made this quite a few times now. My oldest always looks forward to this. Hi MG, Glad you like it!! I making it right now for the first time. It’s in the crockpot. I will be using Spanish rice. Looking forward to it. I did add more beef than called for so I added an additional can of tomatoes. Should be ok. Thanks for letting me know Cindi! Hope you enjoy it. 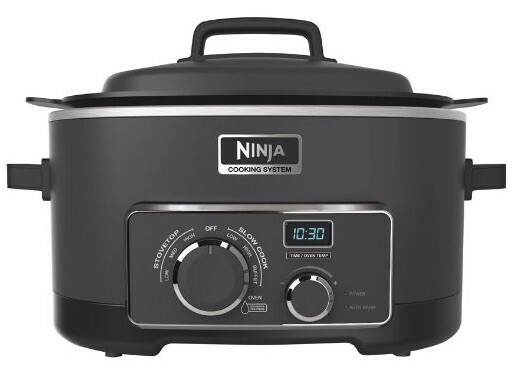 How would you alter this to be done in an Instant Pot?